Climate change induced drought is sweeping across Africa, resulting in starvation and disease in Somalia, South Sudan, Nigeria and Yemen. 20 million lives are at stake, and UN officials are billions of dollars short of being able to respond. 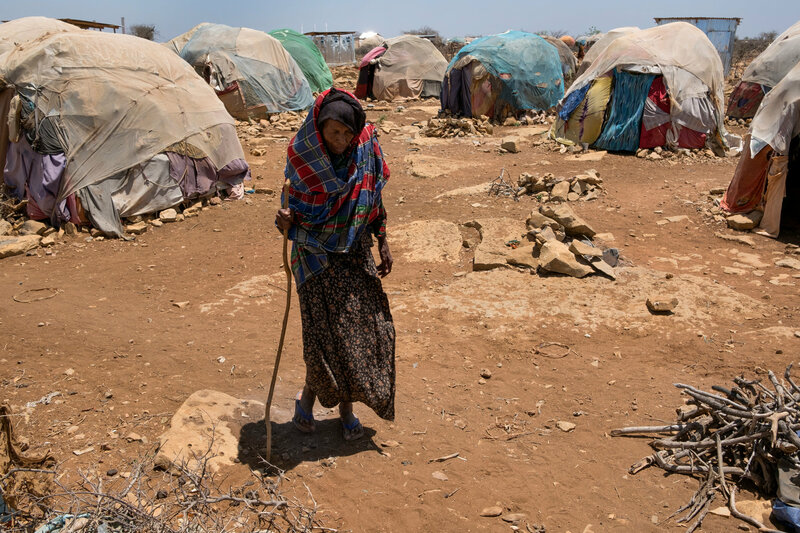 The needed food and water are there, even within the affected countries, but people who have lost their crops and cattle are too poor to buy them, and/or unable to get to where they are because of distance and armed conflict. Yemen is being bombed and blockaded by the US-supported Saudis, determined to force regime change. In northeastern Nigeria, thousands of displaced people lacking clean water to drink and wash with are dying from preventable diseases as the battle grinds on between Islamist militants and the Nigerian military. In South Sudan, both rebel forces and government soldiers are intentionally blocking emergency food and hijacking food trucks, aid officials say. In Somalia, the Shabab militant Islamist group has banned Western aid agencies. When rivers and other relatively clean water sources start drying up, as they are now in Somalia, people start to get sick from the slimy or cloudy water they’re forced to drink. They flee their villages, hoping to get help in the towns. Camps form, but they don’t have enough water either, and it’s hard to find a latrine or enough water for people to wash their hands. Shockingly fast, they become disease factories. Water, of course, is less negotiable than food. A human being can survive weeks with nothing to eat. Five days without water leads to death. Different helping strategies are being emphasized this time. One is simply giving out cash. United Nations agencies and private aid groups in Somalia are scaling up efforts to dole out money through a new electronic card system and by mobile phone. This allows poor people to get a monthly allowance and shop for food and water. It helps the local economy (importing food doesn’t), and people get help fast. The developed countries responsible for climate change owe this help to people who have done little or nothing to contribute to what’s killing them. And many more Africans may soon need it. Sweltering days and poor rains so far this year have also left Burundi, Kenya, Rwanda, Uganda, Ethiopia, and Tanzania parched and on the edge of major food crises. From a New York Times article, “Drought and War Heighten Threat of Not Just One Famine, but Four” by Jeffrey Gettleman (3-27-17). Tags: Millions may die in Africa because of climate change caused by more developed nations. Perhaps the best answer comes from Joel Cohen of Rockefeller University, in his aptly titled How Many People Can the Earth Support? It’s an exhaustively researched 532-page book, but his conclusion can be summarized in two words: It depends. That is, the planet’s capacity to sustain human life depends on how resources are used and distributed and on the values and social structures that shape the way we live. Take food – the number of mouths we can feed depends on what’s for dinner. If all of the world’s people ate like carnivorous Americans – 1,763 pounds of grain each per year, some eaten directly, but most fed to livestock, the 2-billion-ton world grain harvest would support only 2.5 billion people (there are now 7.4 billion of us). But if we all ate like people in India – a mostly vegetarian diet of just 440 pounds of grain per person each year, the same harvest would support a population of 10 billion. So, there’s some elasticity in the planet’s carrying capacity: better, fairer resource use can expand it. But, in the coming world of scarce fossil fuels, that capacity will contract. In recent decades, for example, food production has pretty much kept pace with skyrocketing population growth, partly thanks to mechanization and cheap oil. Reductions in the oil supply would curtail food production, at least in the short term. Shortages of natural gas would also make it harder to synthesize nitrogen fertilizer, which has helped triple crop yields since 1950. Vaclav Smil, of the University of Manitoba, told the New York Times that, without nitrogen fertilizer, there wouldn’t be enough food for 40% of the world’s current (much less future) population. And that’s without considering climate change, which could dramatically reduce crop yields in many parts of the world at a time when global food production must increase by 70% to keep pace with current trajectories of growth and consumption. So, how many people can the earth support? We don’t know. But, given the uncertain supply of fossil fuels and the grim realities of climate change, it makes sense to aim for the low end of the United Nations’ population projections – about 9 billion people, rather than 13 billion, by the end of this century. The good news is that we know how to do this. A half-century of experience has shown that the best way to slow population growth is by ensuring access to voluntary family planning services, educating girls, and providing opportunities for women. Tags: How many people can the earth support with climate change and scarce fossil fuels? According to Richard Heinberg’s latest article, “The Gross Society” (4-28-14), oil companies have given up on discovering new deposits of conventional oil, the fuel that’s powered our “way of life” for almost 200 years. Almost all new “oil” production is deepwater or shale oil or bitumen from Canadian tar sands. These resources are more expensive to produce, and give us less bang for the buck than conventional oil. Not surprisingly, oil prices are rising and, as a result, demand is 20% what it would have been had everything stayed the same since the halcyon days of the 1950s or ‘60s. Bill McKibben says that in order to address climate change we need to allow the price of oil to reflect the true costs of its usage. European governments are closer to this than ours is, but a move in this direction would be way too unpopular for any US government to make. Heinberg’s main concern is dealing with “energy descent,” the increasing unavailability of the kind of energy we’re used to at reasonable prices, and the fact that “there is virtually no discussion occurring among officials about the larger economic implications of declining energy returns on investment. Indeed, rather than soberly assessing the situation and its imminent economic challenges, our policy makers are stuck in a state of public relations-induced euphoria, high on temporarily spiking gross US oil and gas production numbers. So, what’s going to happen? Whether planned or not (and the latter looks most likely), we’re soon going to be living in what Heinberg calls a “leaner” society, one in which there will be a greater requirement for human labor and the skills of our great-great-grandparents. Society, Heinberg says, will be “able to support relatively few specialists in other activities.” We’ll be using some renewable energy sources, but they won’t be powering “a rerun of Dallas. This will be a simpler, slower, and poorer economy. If our economy runs on energy, and our energy prospects are gloomy, how is it that the economy is recovering? The simplest answer is, it’s not,” Heinberg says, “except as measured by a few misleading gross statistics. Each month the Bureau of Labor Statistics releases figures for new jobs created, and the numbers look relatively good at first glance (175,000 net new jobs for February 2014). But most of these new jobs pay less than jobs that were lost in recent years. And unemployment statistics don’t include people who’ve given up looking for work. Labor force participation rates are at the lowest level in 35 years. All told, according to a recent Gallup poll, more Americans say they are worse off today than they were a year ago (as opposed to those who say their situation has improved). Claims of economic recovery fixate primarily on one number: Gross Domestic Product, or GDP. That number is going up, albeit at an anemic pace in comparison with rates common in the 20th century; hence, the economy is said to be growing.” But a higher GDP can reflect lots of things, like increased military spending or higher healthcare costs, “that don’t actually improve people’s lives.” It also means increased burning of fossil fuels and worsening climate change. “Altogether, Gross Domestic Product does a really bad job of capturing how our economy is doing on a net basis. Second, a growing money supply (which is implied by GDP growth) depends on the expansion of credit – increasing levels of outstanding debt, and there are limits to a country’s ability to perpetually grow GDP by increasing its total debt (government plus private). A warning sign that these limits are being reached would be a trend toward diminishing GDP returns on each new unit of credit created, exactly what we’ve been seeing in the US in recent years. Back in the 1960s, each dollar of increase in total US debt was reflected in nearly a dollar of rise in GDP. By 2000, each new dollar of debt corresponded with only 20 cents worth of GDP growth. The trend line will reach zero in 2016. Meanwhile, since rates of consumer borrowing have been stuck in neutral since the start of the Great Recession, to keep total debt growing and the economy expanding, if only statistically, the Federal Reserve has kept interest rates low by creating up to $85 billion per month through a mere adjustment of its ledgers, using the money to buy Treasury bills (US government debt) from Wall Street banks. When interest rates are low, people find it easier to buy houses and cars (hence the recent rise in house prices and the auto industry’s rebound); it also makes it cheaper for the government to borrow. The Fed’s Quantitative Easing (QE) program props up the banks, the auto companies, the housing market, and the Treasury. But, with overall consumer spending still anemic, the trillions of dollars the Fed has created have generally not been loaned out to households and small businesses; instead, they’ve just accumulated in the big banks. This is money constantly prowling for significant financial returns, nearly all of which go to the one percenters. Fed policy has thus generated a stock market bubble, as well as a bubble of investments in emerging markets, and these can only continue to inflate for as long as QE persists. The obvious way to keep these bubbles from growing and eventually bursting (with attendant financial toxicity spilling over into the rest of the economy) is to stop QE. But doing that will undermine the ‘recovery,’ such as it is, perhaps sending the economy into depression. The Fed’s solution to this damned if you do, damned if you don’t quandary is to ‘taper’ QE, reducing it gradually over time. This doesn’t solve anything; it’s just a way to delay and pretend. Cheap, high-energy-returned-on-energy-invested energy and genuine economic growth are disappearing,” and we’re refusing to face these facts and adapt to “our new reality. We teach our kids to operate machines so sophisticated that almost no one can build one from scratch, but not how to cook, sew, repair broken tools, or grow food. What would the world look and feel like if we deliberately and intelligently nudged the brakes on material consumption, reduced our energy throughput, and re-learned some general skills? You don’t have to move to an ecovillage to join in the fun; there are thousands of Transition initiatives worldwide running essentially the same experiment in ordinary towns and cities, just not so intensively. Take a look at http://www.Resilience.org to see reports on these experiments and tips on what you can do to adapt more successfully to our new economic reality. These efforts are self-organized and -directed, not funded or overseen by government, which is not likely to be of much help in present circumstances. Even a little large-scale planning and support would help, and without it the transition will be more chaotic than necessary and a lot of people will be hurt needlessly.” But, Heinberg says, our political system is “broken.” I’d say totally in bed with the corporations more concerned with squeezing the last morsels of profit out of a dying system than facing and dealing with reality. But that’s the nature of the corporate beast. “When it comes to energy,” Heinberg concludes, “we’ve deluded ourselves into believing that gross is the same as net. In the early days of fossil fuels, it very nearly was. But now we have to go back to thinking the way people did when energy profit margins were smaller. We must learn to operate within budgets and limits. This means decentralization, simplification, and localization. Becoming less reliant on long-term debt, paying as we go. It means living closer to the ground, learning general skills, and becoming involved in basic productive activities like growing food. I just finished reading a book called The Great Disruption: Why the Climate Crisis Will Bring on the End of Shopping and the Birth of a New World by Paul Gilding (2011), and want to share my thoughts on it. First of all, the title — seems a bit frivolous, right? Well, if you read the book, that feeling will stay with you. Gilding has it right that we’re headed for the biggest crisis, on many fronts, ever to face humanity, driven by climate change, peak oil, etc. His optimism about our responding to it with some degree of success appears to be founded on nothing more than wishful thinking, however (“we’ll make it because we have to”). Gilding thinks our collective denial about the cliff we’re approaching will be dispelled all at once and once and for all by one or more global disasters (we won’t be the frog that gets cooked), and then we’ll all roll up our sleeves and use the very tools that got us into the soup in the first place – corporate capitalism, our supposed democracy, and our oh-so-powerful lifestyle choices – to makes things as right as we can by then. I think the following facts say it all: Gilding is pals with New York Times columnist Thomas Friedman, someone I can’t read without ranting and raving in response; he believes we live in a democracy and can affect these kinds of outcomes by who we vote for; and he dismisses Marx in one sentence by bringing up the history of the Soviet Union. He does think we should do something about the growing economic inequality in our country and around the world, but he doesn’t explain exactly what or how (it seems to be voluntary), and he doesn’t think actual equality, or anything close to it, would be a good idea for the same old tiresome reason – that we need monetary rewards to do good things. I’d only be in total despair about all this if I thought everyone was buying these simplistic ideas. I think a lot of us have read and are reading the writing on the wall correctly. We just need to get together and start making systemic changes (lifestyle doesn’t cut it) on whatever levels we can. The current system, which rewards those running it handsomely, will resist us, violently if necessary, but what’s the alternative? Just lying down and letting all the worst happen? There won’t be a good explanation for the grandchildren, if we and they survive to be asked what we “did in the war.” One of the first steps (to be done briefly) is pointing out the flaws in system optimism like Gilding’s.